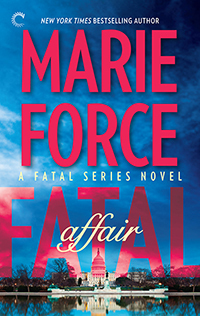 Fatal Affair is the first book in Marie Force’s Fatal Series and I’ll admit to already starting to pick up the others in the series. I love a good cop book and this first book intrigued me as to where the characters can go. We first meet Nick, who stumbles into the murder of his best friend, Senator John O’Connor and quickly calls the police. To his shock, the detective that arrives on the scene is the woman that got away. Six years have passed but the connection between the two is still there. This is probably the first time I would say, read the first book and then pick up the prequel. I think it just adds something to have it read in that order because if you read it the other way around, and the way these characters clicked from the get go, you might get a little frustrated that they don’t get together as quick the second time around. This is also entirely up to you. Six years have passed and Detective Sergeant Sam Holland can’t believe that Nick is standing in front of her and a suspect no less, to a murder of a senator. As she begins to try and pull together the pieces of the senator’s murder and the hidden life he led, there’s another secret to untangle. Why, after one of the most amazing nights of her life and the intense connection between them, did Nick never contact her again? I’m leaving the review at that. I think saying anything more might spoil the book because it really does have some twists and turns that keep you guessing as to who the bad guy really is. I will say I enjoyed the heck out of this. I loved Nick and Sam’s connection and their past together. Sam’s partner is a riot and a I liked a lot of the other side characters. How they’re portrayed makes it feel like they aren’t just a side characters but more essential to the story and potentially have more influence as the series continues. I love it when the story isn’t just focused on these two main characters, but also the interconnecting stories and lives of other characters that can affect them. I would definitely recommend to those who like a good cop book.